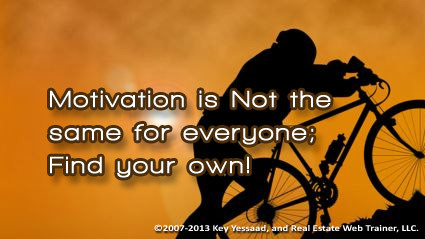 There are two types of Real Estate Agents; those who need Motivation and those who have transcended Motivation… You need to know where you fit, and be honest about it – there is no right or wrong about each way of being. If you are in the kind of agent who enjoys Motivation let me share with you a daily trick you can use to keep yourself going: Get yourself a to-do list in which you add no less than 10 things to-do each day; just find a way to connect these tasks to your Real Estate Business; Second get yourself a highlighter. Every time you accomplish or finish a task just highlight it on your to-do list. At the end of your day focus on what you have accomplished by looking at the highlighted items; then transfer the tasks you did not finish to the next day; and repeat the process the next day. Don’t over-think it; just make sure you have 10 Real Estate Tasks daily!